I’m away from home at the moment. I’ve been on an 850km road trip. Driving that distance – or rather, being a passenger – gives you a lot of idle time and I’d been looking forward to catching up on my reading. for 10 minutes at roadworks, well, what’s a girl to do? So I came up with the first lines of a new romance with a veterinarian hero. So….that’s my opener. But I’m aware that any given person (you don’t have to be a writer) would come up with a different story idea had they been sitting behind that van. So I’d like to know yours. What kind of story idea does this trigger for you? What kind of story would you like to see come out of this photographic stimulus? Would you like to have a go at writing your own opening line/para? Please do – I’d love to read them! People always ask where I get my story ideas. It’s a complicated question…and yet it isn’t. Because they never come from any one place. Sometimes an article I read on the internet will get the wheels turning. Sometimes an overheard conversation sparks something. And sometimes it’s a picture. A picture like this one. 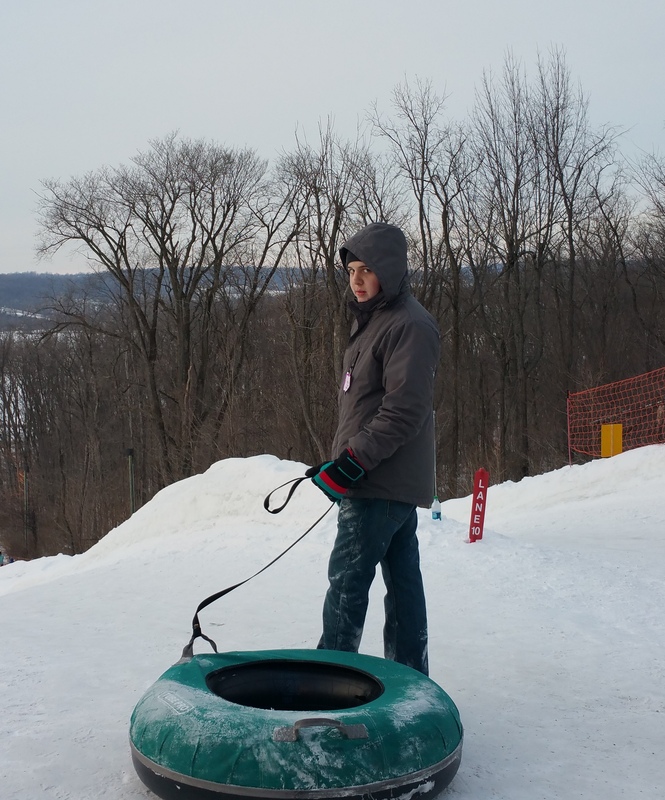 My son went snow tubing with friends a few months ago. When he came back, he had several pictures. This was one of them. I chuckled and told him his facial expression was a little creepy. But as I looked closer, I caught a little flash of red just behind him. A small marker that said Lane 10. That was it. The idea and title for a new book. A thriller. One where something terrible happens on Lane 10. Right now that’s all it is. The smallest kernel of an idea. But once I get a chance, I plan to explore it just a little more. And hopefully, one day, that photo will give birth to a brand new book–painting not just a thousand words, but tens of thousands of words. And there you have it. Short and sweet. I would love to hear your thoughts! If you’re an author, do you have an interesting story about where you got one of your ideas? If you’re a reader, have you ever read a book and wondered how on earth the writer came up with the plot? Speaking of stories, I have a new medical coming out in July. Part of the fabulous Midwives on Call continuity. Since I love all things Australia, I was thrilled to be included in the series!